Heat oven to 350°F. Bake cookies as directed on roll. Cool completely, at least 20 minutes. In large resealable food-storage plastic bag, place 8 cookies. Seal bag; coarsely crush cookies with rolling pin. Store remaining cookies in airtight container for another use. In small bowl, place 1 1/2 cups of the whipped topping; stir in 1/2 cup chocolate syrup until blended. In another small bowl, place 1 1/2 cups whipped topping; stir in strawberry jam until blended. 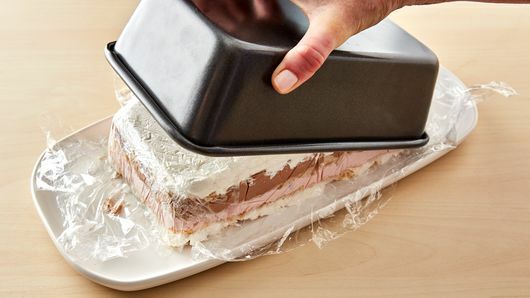 In 9x5-inch loaf pan, place 2 long pieces of plastic wrap in cross shape overhanging sides with enough to wrap cake. Spread 1 1/2 cups of the plain whipped topping in bottom of loaf pan; top with 1/2 cup of the crushed cookies. Drop chocolate whipped topping by spoonfuls over cookie layer; spread evenly over top. Sprinkle 1/2 cup crushed cookies over layer. 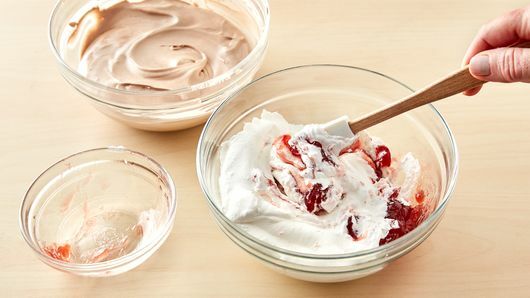 Drop strawberry whipped topping by spoonfuls over cookie layer; spread evenly over top. Sprinkle 1/2 cup crushed cookies over layer. Spread layer of the remaining plain whipped topping and crushed cookies over top. Wrap overhanging plastic wrap to cover top of pan. 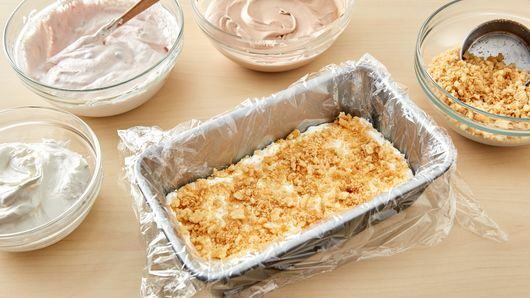 Freeze loaf at least 8 hours or overnight until firm. To serve, uncover pan. Place serving plate upside down over top of pan; turn plate and pan over. Remove pan; remove plastic wrap. Top with Toppings. Let stand at room temperature 5 minutes. Using serrated knife, cut into slices. 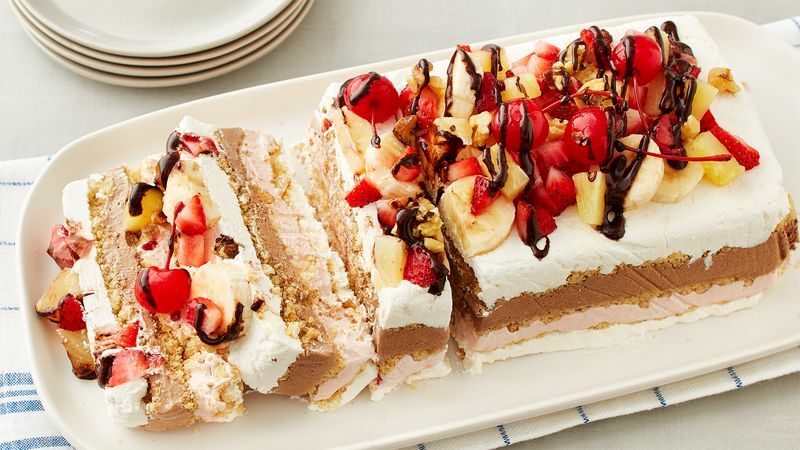 Cover and freeze any remaining dessert. For a different berry flavor, replace strawberry jam with raspberry jam. Make sure to drain and pat dry maraschino cherries and pineapple tidbits when topping cake so there is no excess liquid.